Transform yourself to become the person you always wanted to be! This workshop will empower you to attain internal happiness, peace & ultimate bliss. It will boost your energy level to the fullest whcih will help you achieve desired goals in life. 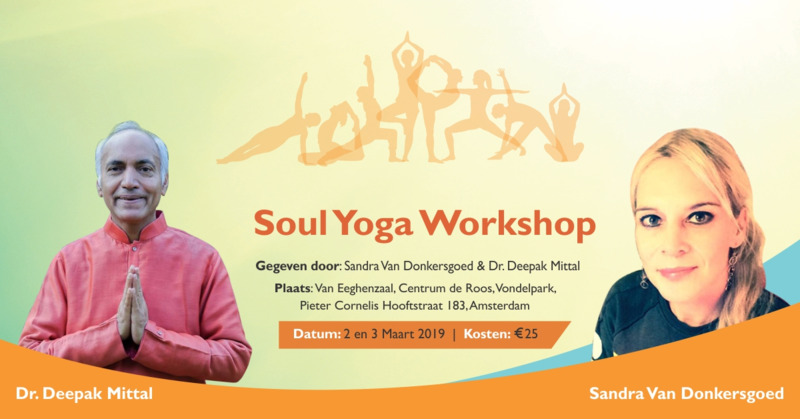 Get connected to your spiritual power with guided meditation techniques by Dr. Deepak Mittal & Asana practice by Ms. Sandra Van Donkersgoed. Date: 2 & 3 maart 2019. Location: Centrum de Roos, Vondelpark, Pieter Cornelis Hooftstraat 183, Amsterdam. About Dr. Deepak Mittal: he is an Indian business tycoon, investor, philanthropist and visionary. He is the Managing Director of Sonalika Group of Companies. He has attained his spiritual knowledge from the leading spiritual gurus of India. With years of experience of meditation, he has embarked on this spiritual journey. By engaging on the divine path of spirituality, Dr. Mittal discovered his true self & higher aspects of life. He truly believes that the most beautiful aspects of spiritualism is that, it can be experienced differently by everyone. With the aim of sharing his precious knowledge of self-realization to the world, Dr. Mittal has developed a unique life-altering meditation technique namely Soul Yoga that will empower you to attain the super conscious state of mind with internal happiness, peace & ultimate bliss.